Garlic spaghetti with beans and arugula contains pantry staples jazzed up with a couple of garden-fresh favorites. Photo by Fran Hill. A friend is building a new home and when discussion turned to the kitchen, she mentioned that the architect was influencing her to include pull-out shelving instead of a pantry. Apparently, pantries are a thing of the past in new construction. What?? I couldn’t live without my pantry. Where do you store large, ugly but totally functional and necessary containers of flour and sugar? Where do you put all of the jars of salsa that you canned from the garden tomatoes? Where do you stash the crockpot, griddle, food processor or ice cream maker that you only use once in a while, but really don’t want to be without? Where would you hide the guilty pleasure of Double-Stuff Oreos? Please don’t tell me that a couple of panels of pull-out shelving can handle all of this. It couldn’t. Not in my kitchen. Admittedly, I can be a bit of a food hoarder. I stock up when things I know we will use are on sale. I impulsively buy things that I have no idea what to do with…or if I will even like…because they seem cool or interesting. I once had over a dozen cans of chickpeas because every time I visited the grocery store, I didn’t remember that I had already made the purchase. My pantry has been influenced by living in a town without a grocery store and fear of running out. Both my husband and I recall winters of our childhoods with blizzards that left us stranded, but thanks to the preparedness of our mothers, we were never without food. We inherited that gene. The prairie pantry bulges. 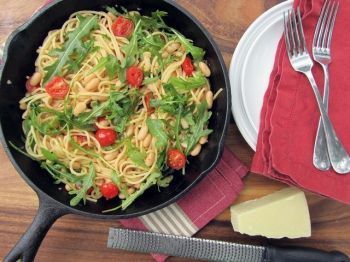 Garlic Spaghetti with Beans and Arugula starts out as a pantry meal. Dry pasta and protein-packed canned beans are always basics that I keep on hand. Garlic and red pepper flakes spice things up, and soon a quick trip to the garden could yield the arugula and tomatoes to freshen the final dish. Round the meal out with a loaf of crusty bread, extra cheese to grate on each serving, and maybe those Oreos from the pantry for dessert. Cook pasta according to package directions in salted water. Drain, but reserve 1/4 cup of pasta water. Set pasta aside and keep warm. While the pasta cooks, heat oil in a large skillet over medium heat. Add the garlic and red pepper flakes. Cook until garlic is tender and fragrant. Add beans and tomatoes. Season with salt. Cook until heated through. Add the pasta; cook stirring frequently. Add reserved pasta water and arugula, tossing to combine. Remove from heat. Stir in lemon juice and cheese. Serves 6. We purchased our house three years ago and it came with a pantry. Now that I have one I would never live with out it. It is great for hiding all of the small appliances (blender, mixer, toaster, etc.) that used to sit on my counter in the old house. I actually have less cupboards and counter space in this house but it really looks like there is more. I would tell your friend to stick to her guns on the pantry. You can always have the pull-out shelving too. Funny. I've had similar repeat purchases of canned chickpeas. I was in a very old house the other day, and I noticed that they intentionally left the pantry door off the kitchen open because it was so rustic, with old brick exposed walls and the old wood shelving ... and those jars of salsa or whatever. Nothing against modern cabinets, but you just can't manufacture that.